James Arthur Boberg (Jim) of Lake Hubert passed away Friday, November 28 at the Care Center in Crosby Minnesota. Jim was born in Arlington, South Dakota on April 28, 1921 to Swedish immigrants August and Ruth Boberg. His parents moved to the Nisswa area in 1924 and established Boberg's Resort on Gull Lake. In 1943, at 22 years of age, Jim borrowed money from his father to start a resort on Lake Hubert that became known as Beachland Cottages. In 1957 he married Gloria Wass. In 1958 Jim and his brother Carl established Boberg Lumber in Nisswa. 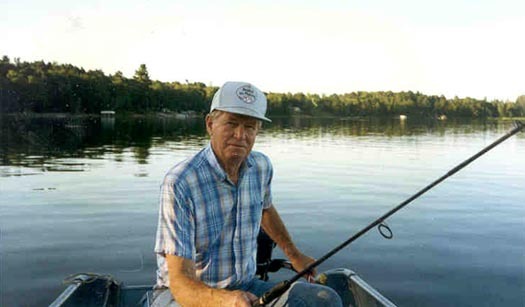 Jim loved to fish and spent many happy hours fishing with resort guests, friends, and family. Jim loved people. He is survived by his wife of 57 years, Gloria, brother, Carl, sons, Eric, John (Mary Kay), and Dan( Lynn), and daughter Lori (Pierre), and 9 grandchildren.